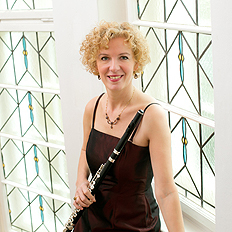 Hungarian flutist Anna Garzuly-Wahlgren studied in Budapest, Munich and New York, completing her studies with highest honors. While still a student, she won numerous prizes at renowned music competitions in Geneva, Scheveningen, Kōbe, Markneukirchen and Budapest. She has appeared as soloist in concerto performances with, among others, the Gewandhausorchester under Herbert Blomstedt and Riccardo Chailly. Also a passionate chamber musician, Anna Garzuly-Wahlgren appears regularly as a guest artist at important international festivals. She has performed with various ensembles, among them the Sabine Meyer Ensemble, the Linos Ensemble, the Gewandhaus Octet, the armonia ensemble, the Munich Chamber Orchestra and the Leipzig Chamber Orchestra. She was a founder member of the renowned Leipzig Flute Ensemble “Quintessenz,” which marked its 20th anniversary in 2016 and is featured in three CDs on the GENUIN classics label. She is in high demand as an educator and has given master classes throughout Europe and Asia, and is a mentor of the Mendelssohn Orchestra Academy of the Gewandhausorchester.